A month ago, I argued that the Conservatives were a safer bet when it comes to getting more nuclear power stations in the UK. One of my arguments was that the Conservative back benches are more favourable than the front benches meaning the pressure would be on a Conservative government to push more towards nuclear as compared to a Labour government, which may be hindered by the back benches and especially any potential coalition partners (no-one other than the Ulster Unionists like the Tories so there's no worry about coalition partners with a Conservative Hung Parliament). Mark Field, MP for the Cities of London and Westminster, validates my point by writing a neat article arguing for stronger support for nuclear power. A lot of what he said we've been saying for ages of course, but there were a few interestings things. One point was how nuclear proponents in Britain are not attacking the opposition head on with their doom-mongering and falsehoods, but rather trying to sidestep their issues by arguing the situation with global warming and energy security is so dire we have no choice but to accept these negatives. Another point, which got me thinking, was the factors that led to the halt in nuclear construction in the 1980s. It is easy to always blame an overburdeonsome regulatory framework, one which imposed unecessary and unproductive red tape on the industry, on this dry spell. That is of course a major factor, but there are other issues of the time, namely the oil shock, and the 1980s high interest rates. Mark correctly points out that the oil shock caused a dramatic reduction in energy consumption. Lower than expected demand is not good for nuclear. Similarly, high interest rates affect nuclear economics far more dramatically than fossil fuels. This is because of the difference between CAPEX, capital expenditure, and OPEX, operating expenditure. In the context of power stations, CAPEX would be the cost of building the facility in the first place, while OPEX is the cost of running the facility, including the cost of the fuel. Comparing fossil fuels and nuclear, one thing becomes abundently clear: fossil fuels are OPEX intensive, while nuclear is CAPEX intensive. Fossil fuels need a constant supply of fuel to keep the plant going, so they have the burdeon of this constant expense throughout their life. Nuclear fuel on the other hand is only a tiny proportion of the overall cost. 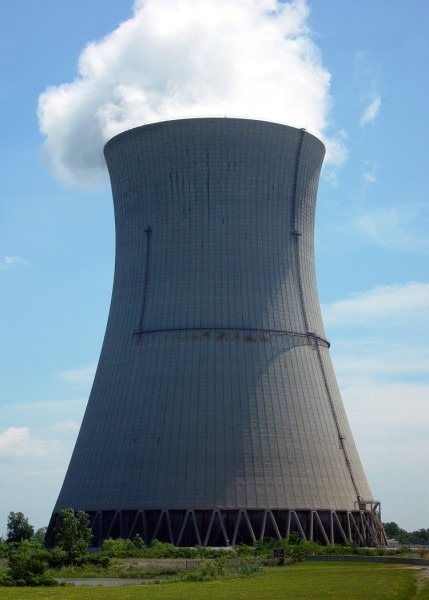 The energy density of uranium is so great that a few tonnes of uranium will keep a reactor going for a year. However, a nuclear reactor, with all its sophistication (anyone can burn some coal, but making uranium go critical on water is not a job for the sloppy) and its need for containment structures and the like, entails comparatively higher construction costs. This is to nuclear's disadvantage. It's better to be OPEX intensive than CAPEX intensive. The neat thing about being OPEX intensive is that you spend your money as you are making money. Sure the incessent cost of the fuel must be a pain, but at least your generating power - and revenue - as you buy. If you're CAPEX intensive, all your money is paid up front and you have to hope your forecasts were correct because you are dependent on many years of production to earn back the money. The drop in consumption after the oil shock is a problem for a CAPEX intensive energy source since there is less demand for its energy without a corresponding drop in investment. For a fossil fuel power station running on reduced power because of a lower than forecast market demand, at least they have the consolation of not having to pay as much for fuel, reducing OPEX. And naturally, since those fat loans are going to be used to cover CAPEX rather than OPEX, it goes without saying that the high interest rates of the 1980s were not kind to nuclear prospects. So that's another couple of reasons to add to the grand list of factors bringing about the nuclear crash. The oil shock reducing energy demand. Three Mile Island and Chernobyl. A short, rather laughable tirade over at BAUT. The toxic wastes from atomic power systems will poison planet Earth for thousands of years to come. Our soil and water are being poisoned by the widespread burying of nuclear waste on land and sea! Atomic energy is always in conflict with all Life, because the very nature of 'atom-splitting' is destruction not construction. For this reason, it can never be used for peace or peaceful activities. How can peace be achieved by that which is by nature unpeaceful? Splitting atoms disrupts the flow of force through them. Never mind the tired regurgitation of blatantly misleading hyperbole about waste and pollution at the beginning. What's really interesting is the pseudo-scientific tone of the rest of it. Nuclear fission is apparently bad because splitting atoms is "in conflict with all Life" because it is "destruction not construction". Now, what the hell does that have to do with anything? Natural radioactive decay, the kind of decay, which fuelled the primordial vents from where life first sprang, is the destruction of atoms. Metabolism is the destruction of all sorts of molecules. This really sums up the quasi-religious core at the heart of many environmentalists. Allusions to vague concepts such as "the flow of force" through atoms are as far removed from really scientific basis as you can get. And yet this particular guy is basing his nuclear opposition on that. In a scientific debate, we can run circles around your average environmentalists. But if they fuel their position with this New Age, junk science rubbish, how are we supposed to tackle them. If nuclear must be opposed because splitting atoms disrupts the flow of force through them, given that the statement is nonsense, how can we argue against it. You show an argument is nonsense, when that is what it is meant to be from the start. David Cameron MP, leader of the Conservative party and HM Loyal Opposition in the House of Commons, started a video blog to better communicate to the electorate without having to depend on the rather undependable mainstream media. Good idea. Sion Simon, labour MP for the constituency of Birmingham Erdington, didn't like it. Simon prepared a spoof video in which he parodied Cameron by doing a poorly written rap, which included offering to sell his children and prostitute his wife. Tom Watson, Labour MP for West Bromwich East, prolific blogger, posted the video on YouTube. The video got multiple thousand hits. The spreading of the word that Cameron sells his children and prostitutes his wife caused massive controversy. Simon appeared on Sky News to answer questions about his video. It wasn't the best of interviews from the perspective of the Labour spin doctors, since he came off as rather petulant. But more importantly, he said some things that were rather questionable. Tom's a proper blogger, who's been a computer blogger for years; Britain's first blogging MP. He's serious about the video blogging. It's a medium he's committed to. I, for instance, am not particularly interested in blogging. It's not my thing. Neither is David Cameron. He self-evidently isn't. His blogs, what he talks about, is empty, is meaningless, is shallow. It's patronising. It's just the way to turn young people off. The idea that politicians only engage with the medium when it's got something in it for them. If you're really serious about it, do it properly. If you don't mean it, don't do it. It is pretty clear Simon disapproves of Webcameron. Specifically, there are two criticisms. The first really isn't a problem with the blog itself, but with Cameron's act in general, which is faithfully reproduced in the blog. So we'll ignore that. The second is that Cameron isn't really a committed blogger, but is merely using the blog to further his own ends (which involves getting his message across to the electorate so that they might vote his party into government at the next general election). In Simon's view this is wrong. It is apparently only right and proper to blog when the blogging is an end in itself, as is supposed to be the case with Tom Watson, rather than when blogging is purely a means to an end (such as conveying your message to advance the standing of your party), as in the case of Cameron. I will agree with Simon that I don't think Cameron is committed to the medium and that he is only using it because he thinks it will serve his political aims. But I fail to see any problem. You don't have to be "committed" to the medium to use it. As Simon confesses, he is not a blogger himself. So I suppose we can forgive him for missing the point completely. The point of blogging is to communicate with the wider world,free from the limitations and exclusivity of the mainstream media. If you have something you want people to hear, you can blog. David Cameron is in that position. He has something he wants to say to the electorate and he uses his blog to say it. That's what it's about. If it wasn't, then we could criticise the countless blogs, some created years ago, that have seen only one post. The bloggers who created them had something to say on that day, and then nothing after that. We can safely say they aren't committed to medium (assuming they are still alive and well and capable of blogging if they wanted). Does Sion Simon disapprove of their rather limited blogging activities? Many prolific bloggers enjoy blogging for its own sake in addition to the message they're conveying. But that isn't a requirement. There is no obligation to say a pledge of allegience to the blogging community. No condition that you join the National Union of Bloggers. No need to get a tattoo saying, "Born to blog!" Sion Simon seems to view blogging as some kind of after-school club that Cameron has gate crashed simply to avoid playing afternoon sports. Perhaps if he paid more attention to his friend's outreach activities, he might have understood how false this is. It is a good thing that Cameron is contributing to the alternative media, regardless of how important the medium is for its own sake in his eyes, just as it is a good thing that Tom Watson is. It's about the message, and here we have just a couple of people spreading theirs. Another note: the growing populating of politician bloggers, particularly those "not committed to the medium", speaks volumes for the growing power of the alternative media. For the love of neutrons NO! The rumour spread by Iain Dale is that Al Gore is joining the British government. Well there goes our energy security. I hope exploration in the North Sea is going well because if Gore is here, our energy consumption will go through the roof. And of course, none of it can come from nuclear reactors (unless they are unseen across the Channel) so demand for hydrocarbons will spike more than when David Cameron is cycling to Westminster (ably followed by his armoured motorcade). Three days ago, USN Captain Wally Shirra died at the age of 84. Schirra was one of the original Mercury 7 astronauts and a true man of the space pioneers, flying on all three of the great space programs: Mercury, Gemini and Apollo. On Sigma 7, the fifth Mercury mission, he spent over nine hours in space, a record for the American space program at that point. He tested star navigation techniques and space photography and made the first ever live radio broadcast from an American spacecraft to listeners on the surface. But most importantly of all, he became the first astronaut to have a wee nip in space after smuggling a small bottle of whiskey on board. A true test pilot of the age. Gemini VI marked another important space first for this remarkable, often underappreciated space program: the first space rendezvous. Schirra redefined the meaning of space rendezvous from the low hanging, Soviet definition of rendezvousing spacecraft passing with several miles of each other (a definition which suited their purpose so they could claim Vostok 3 and Vostok 4 marked the first ever space rendezvous), to the proper definition of coming within feet of each other and stationkeeping. With his co-pilot, Tom Stafford, Schirra achieved the first one, meeting Borman and Lovell (of Apollo 13 fame) in their Gemini VII spacecraft at an altitude of 270km. Schirra's final flight was Apollo 7, the first manned Apollo mission and the return to flight after the Apollo 1 tragedy. During the eleven days in Earth orbit, the crew, including rookies Eisele and Cunningham, proved the Apollo spacecraft fit for purpose and laid the groundwork for its operation on the subsequent flights to the Moon. They also made the first live TV broadcast from an American spacecraft, an Emmy award winning broadcast at that. Colds struck the crew for the first time in space and only generous doses of Actifed kept them sane for the duration of the flight. Schirra went on to make some heartfelt ads for Actifed after that. John Glenn and Scott Carpenter are the only surviving members of the Mercury 7. ... any solution you suggest to solve problems with oil and gas wells involves radioactive material! How do you solve the problem of power supply in remote sensors placed down the well? Do you make batteries easier to fish and replace? Do you develop a way for the component to extract energy from the heat of the well or the kinetic energy of the fluids? Of course not! You use an RTG! How do you solve the problem of gas well deliquification (liquids accumulating in the bottom of the well blocking the flow of gas)? One possible option is to boil off the liquids. But how to deliver the heat? Microwaves? Damned efficient, but no. Place a radioactive heat source down the well. Nuclear power: the answer to all of life's problems!